A Thing for Roses: Happy Holidays! 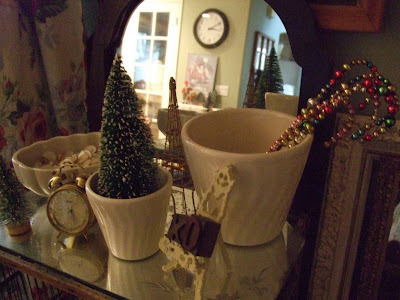 I finally got around to taking some pics of my holiday decorations. 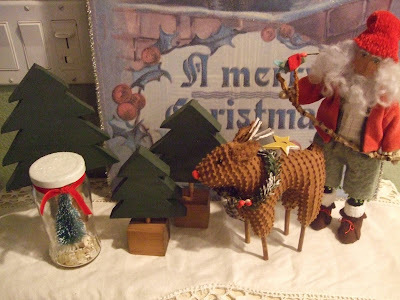 After I took the pictures, I realized that I was missing some of my favorite holiday items and my husband informed me that there was another box of decorations in the garage. Great! So, I still have a few more things to put out, but this will give you an idea what I have done so far. Remember the ornaments I made recently? Well, I decided to make for one for myself out of my last vintage metal reflector and some fun bits. The completed tree. 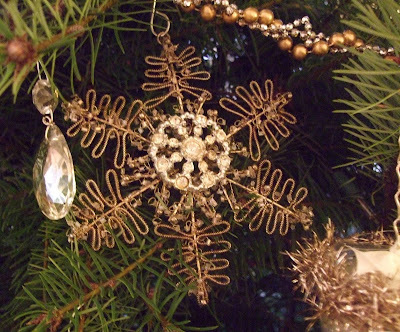 This year I kept it very simple using only silver, gold, white and crystal ornaments. 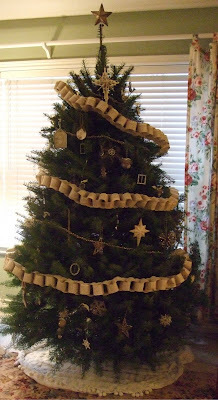 I spent a few hours in front of the tv making the paper chain out of an old dictionary. 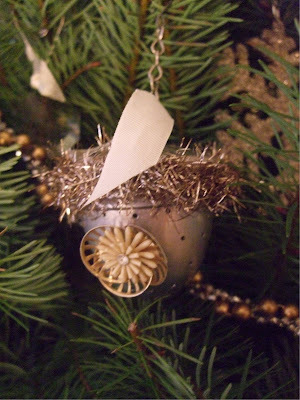 Kind of blurry, but I found these old metal tea strainers tucked away in a drawer and glued on some vintage tinsel and a little bling. Love how they turned out. 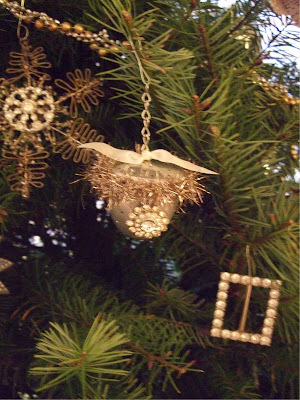 I also took my collection of vintage rhinestone buckles (13 of them) and hung them on the tree for a little more bling. Here's another one I made. I didn't, but you could fill them with some dried lavender for a cute and good smelling ornament. Love this little bird that was a gift from my sweet friend Martha. Another of the buckles. I got this adorable ornament from Debbie at Monticello. She had several for sale in her space at the Holiday Sale (still going on) and it was tough to decide on just one. This lovely was also purchased at Monticello in Vicky's booth. Love the sparkle! 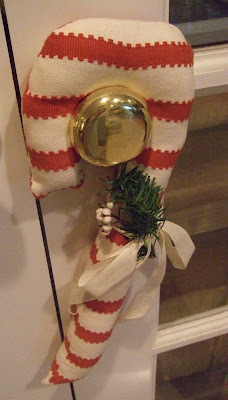 Another make-do idea I stole from my good friend Mitzi. 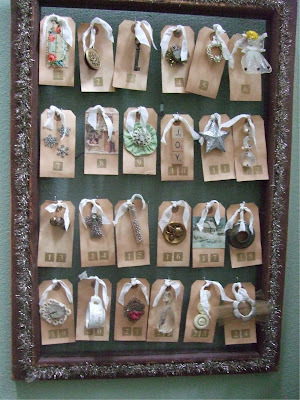 I loved how she hung vintage chandelier crystals on her tree so I dug through my collection and hung a bunch too. Most of them are like these with three crystals. I like them because they kind of remind me of snowmen. Here are a few more shots from around my house. Some of you have probably seen this advent calender before. I made it at Joy's house a couple years ago and I just love it. I used a lot of my favorite things on it. It was really easy and a fun project to do. 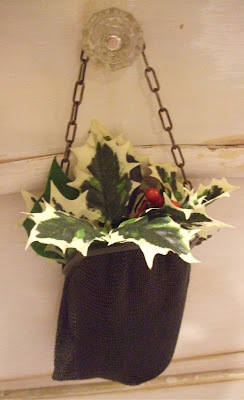 My favorite antique mesh purse with some faux holly. Candy cane I bought from Kathy at Colby Cottage when I was down visiting her shop in Eugene awhile back. 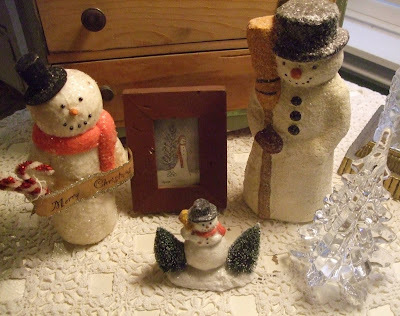 And finally, a few snowmen. I hope you enjoyed seeing a little of my holiday spirit. Today the hubby and I spent the morning doing a little shopping. We came home, I took a nap and then took both my kids to the dreaded mall. It's a good thing I had that nap. Actually, we had a really nice time and everyone found what they were looking for. I wish I could say I was completely done with my shopping, but unfortunately I still have a few things to buy. I hope you are all enjoying these last few days before Christmas and are not getting too stressed out. I'll be back soon with another "dreaming of Paris" post. I love every single thing. 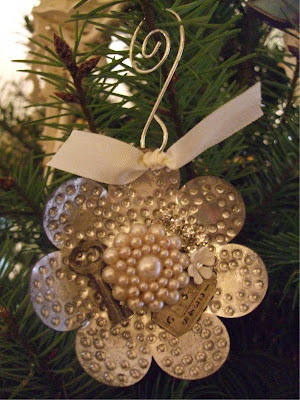 Your tree is beautiful...love the chain...and the buckles are so inventive and lovely! Seriously everything looks wonderful! And your pics do not look blurry at all! Hey, I was at the mall, too!! But the girls and I went in the morning... Love your tree, Lisa!!! Hi, Lisa! LOVE the buckles!! 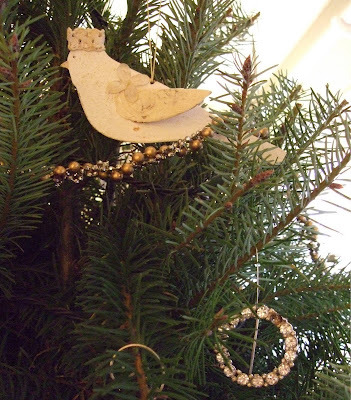 Bling on a tree is awesome! Your crystals remind me that I have a bunch somewhere .... hmmmm .... wonder where? Everything is lovely and thanks for sharing! I hope to relax and spend some time catching up with everyone's posts .... my last post until New Years was my 100th and birthday giveaway. Thanks for all your inspiring posts this year and have a super holiday! very pretty xmas tree.. Merry Christmas! oooohhhh Ahhhhhhh!!! I love your decorations. Your tree is beautiful- very very beautiful!!! It's beautiful, Lisa! I love all of your home made ornaments. See you at our next craft meet up! Love all of your recent photos and posts. 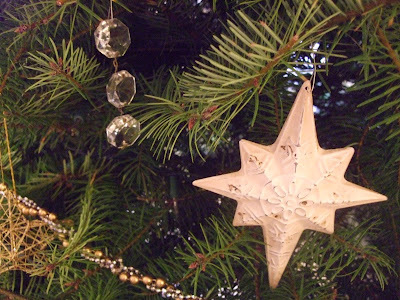 Those light reflector ornaments are just dreamy! I am in Eugene. Are you in Portland area? Merry Christmas , Lisa and Family! I love how you show your holiday spirit, Lisa. Hope you had a wonderful Christmas! I really like your pictures, but really like the calendar! I love your ornament collection. What a great way to reuse old pieces. Now is the time of year I don't like, when all the pretties have to be packed away again! I am a new follower to your blog, and I really enjoy it. I also love roses. I have 30 rose bushes in my yard. I am an Or nurse in Ft Worth Tx, and have a small business in Collected Treasures in Arlington Tx. Looking forward to your future postings. 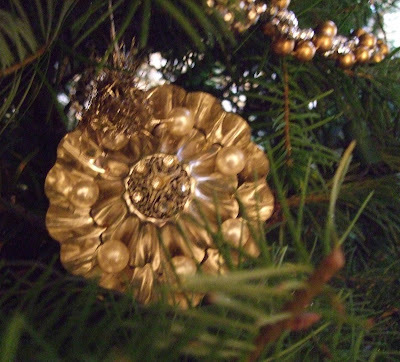 Pretty ornaments, Lisa! Hope your Christmas was wonderful! It all looks fabulous! Love the tree and all the pretties on it. Hope you had a wonderful Christmas and are planning on an eventful fun New Year!